The first hint of the well-known American monthly Consumer Reports came back in the 1930s when a Consumers' Union was formed. The first issues of their publication dealt with businesses that were not paying their employees livable wages, but over time their mandate shifted and grew to include many products and labratories. Today their testing labs are located in several locations in the USA, and they do an annual survey, which their members fill out. The sheer volume of participants in these surveys makes it a valuable resource. Lawrence Crooks, a car buff who was independently wealthy became a member and started the car testing division. Today that is one of the most well-known, and best used department. It is a huge boon to those about to buy a car, whether new or used. In 1942 they officially changed the name of their magazine to Consumer Reports to let people know their information was intended for everyone, not just the union members. A related website was started too, which now has over 3 million subscribers. This non-profit organization has grown very large over the years, outgrowing several big buildings, with their head office now in Yonkers, NY. Their Consumer Reports and more specific subsiduary Buying Guides are produced in Spanish, and Canadian editions as well. This brief background outine is just to show that there is an impressive resource for checking out products before you go shopping, so you get the brand and/or model number with the best results instead of a disappointing product, (sometimes known as a lemon). They have excellent Buying Guides for car buying, electronics, household appliances, and their Health Reports can be a great help to you. Need to learn more about shopping guides? How to use them? Sign up for my free email course that explains things in greater detail. At first glance I found the detailed reports far too detailed-looking for me. I skimmed them, and got limited benefit from them. I don't mean to say you have to understand all their testing procedures and the codes they use for evaluating them, but after I subscribed to the magazine and took the time to read most of the pages more slowly, I found that I did understand much better. They are being helpful to us. Consumer Reports is careful to sort out the features, for some of us like one thing about a product, and someone else might find a different feature the key deciding factor. The lowest price is not always the best feature - but sometimes it is. By showing the range of results they got in their lab studies we can feel confident that they have been thorough. If you are not aware of this resource, I suggest you visit their website and check them out. Consumer Reports. If you are a Canadian, look for the Canadian Extra, which is a section of both the regular magazine and their website. It zeros in on products that are available in our country. (Otherwise, we have to find ways to do cross-border shopping). The range of products they check over is wide. From cars, and household appliances, to electronics, health and fittness items, and home and garden tools and many common items. In fact, they often hear about new products before they are made available to the public, so their testing results are out before you can buy the items. 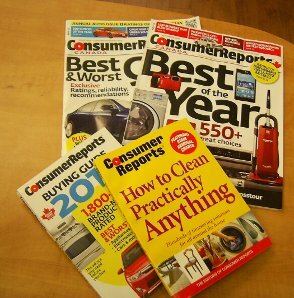 If you subscribe to the magazine, Consumer Reports, you will also receive their annual Consumer Reports' Buying Guide. That is a paperback compendium of about 1600+ products, and shows you which are the best and worst appliances, cars, electronics and more. Over all, Consumer Reports is a valuable monthly resource publication, that uses testing labs and an annual survey of members to help members and subscribers choose the best products to buy in North America, and therefore in other countries too. Their annual Buying Guides are prize handbooks for shoppers.